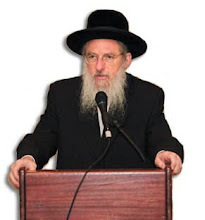 I am trying to withhold judgment over the latest controversy in Israel regarding “racial” segregation in the orthodox schools until I hear the “segregationists” point of view, which has been largely ignored by the general media. Would you be able to clarify for me what's going on from your point of view? of secular Israel, ranging from severe charges of corruption in the highest echelons of the government to growing drug use, violence and intimate assault among the youth, and including a desire to mask the embarrassment over the recent military debacles, the media bashes the orthodox, grasping at straws to burn for a smoke screen. But what's worse, the secular establishment of Israel itself is by no means free of this racism: consider that the very Supreme Court which accused the orthodox families of racism has itself only one Sefardi judge among 14 (7%). Similarly, the very self-righteous media, guilty of irresponsible and imbalanced coverage of orthodox racism, has itself not even one Sefardi in a prominent, public position. That does not mean to say that there is no discrimination of Ashkenazim against Sefardim in the religious sector. Admittedly, such an attitude does, unfortunately, exist among some Ashkenazim. This phenomenon has to be addressed and corrected. But in this instance, the courts and the media omitted information and distorted facts while also reporting them out of context and out of proportion of what really happened. For example, the school claims that the reason the other girls were not accepted is because their parents refused to accept a code designed to uphold a higher standard of religiosity [such codes usually address internet and cell phone use, mode of dress, recreational activities, etc.]. Those who accepted the code were accepted to the school, those who didn't were not, and it had nothing to do with ethnicity. In fact, a full quarter of the girls that were in the school are Sefardi [compare 25% of the girls to 7% of judges], and their fathers are in jail with the other fathers. Why are these men in jail? In this particular case, because they demand the right to educate their children in a context consistent with their religious values, even if it means separating from those who don't share those values. (At one point, the parents moved their daughters to another, private school until the court questionably prohibited them from doing so). But also because, even in general, they believe that one is entitled to educate his children in a way that preserves his own family's or group's heritage. So what's this Jewish segregation all about? As members of the “modern” world, we often ascribe to a melting pot mentality. The idea is to amalgamate disparate peoples and cultures into one united monolithic nation. The advantage is unity, stability and common purpose. The disadvantage is the disregard and disappearance of diversity in all spheres of life. As in all matters, the Torah recommends a healthy fusion and balance between the two extremes. On the one hand, Judaism obviously dictates conformity of belief and law for a unified and stable national purpose. On the other hand, Judaism also celebrates and encourages the perpetuation of established familial and ethnical diversity and expression. The Midrash says that when the Jewish people departed Egypt and crossed the Reed Sea, they did not all cross together in the same path, but rather the sea split into 12 different tunnels for each Tribe who were separated one from the other by walls of water. Interestingly, the Sages note that the Tribes, though traveling separate but parallel routes, could still see each other through the walls of water. From this we see that despite the fact that the Jewish People were sharing a common experience and moving toward a common destiny, they were not merged into one singular mass, but rather maintained their diversity within the joint national venture of Redemption. As long as the Tribes were able to see each other through the walls of water [where water symbolizes Torah] this separation was not segregation but rather the celebration of diversity within the national experience. Similarly, the Tribes maintained separate sections within the encampments of the Jewish People during their 40-year sojourn in the wilderness. And even after the conquest of the Land, it was divided into distinct, separate geographical areas for each Tribe. Biblical sources indicate that the different Tribes had distinct pronunciations, mannerisms and customs. This is not viewed as being undesirable or detrimental to national unity. On the contrary, each Tribe's particular strengths, talents and characteristics are celebrated within the People's national unity. In fact, according to mystical sources in Judaism, each Tribe had their own form of prayer which had its own unique access and effect on the spiritual realm. It is in this light that we should view the separation between different groups in Judaism: Ashkenazim, with the sub-groups of Yeshivish and Chasidic and the sub- sub- groups within Chasidic; as well as Sefardim, with their sub-groups; and also the Yemenites. Every effort should be made to preserve the beauty and unique contribution of each of these very important and integral facets of the Jewish People. There is nothing wrong, then, with establishing schools and determining criteria designed to preserve the distinctiveness of these groups. The Sefardi rabbis also encourage the establishment of “Sefardi” schools in order to preserve and perpetuate their glorious and illustrious tradition. Obviously, I'm not suggesting there be no contact between groups. On the contrary, on the social, communal, political and economic levels there should be, and is, natural and mutually beneficial interaction. Nor am I saying that there must be separation in education. I'm just saying that there is nothing wrong with maintaining institutions designed to preserve a specific community's unique expression of Judaism. As long as the different groups see each other through the lens of Torah - by loving, respecting and celebrating each other's Torah based traditions, customs and practices - we can cross this divide of exile together toward Redemption.